As an Expat Aid Worker worth your salt, you never, ever fly business class. EAWs really like not flying business class, actually. (Said with a straight face). Because, seriously, how on earth can you justify the exorbitant price? (OK, maybe if a discounted rate is on offer, especially given that you need the extra luggage allowance to carry flipcharts and toolkits. But not as a general rule). As a real EAW, you are more than ready to put up with a little discomfort (so long as the total flight duration is less than the eight-hour cut-off mandated in HRI’s official travel policy of course). After all, one bad night’s sleep is nothing compared to the conditions experienced by the people you’re going out to help. (Though you do often think to yourself how much more productive you would be on arrival if only you had a bigger seat…). Your absolute commitment to traveling economy class is often bolstered by remembering that first time you were forced to fly business class (because there was an urgent conference to attend and because the trip was less than a week and it ended up being cheaper than economy anyway). (Well not cheaper as such, but only a teeny bit more expensive). (And anyway, it was from someone else’s travel budget and it’s not as if the money was going to be used for actual projects because that’s a different line item). The big seat was nice, as was the air-conditioned departure lounge and the free drinks. But nice as it was, you just didn’t feel at home with all those oil workers and all those non-genuine EAWs. You would never do it again of course (unless you were using air miles to get an upgrade or something). Or, well, unless you had just nabbed a job as a UN consultant and you were on your way to a southern Africa capital and your ticket was booked at the last minute (because the hiring paperwork took for-freaking-ever – not your fault!). Even though the cost was around USD 10,000 round trip, and your task for the 3 days involved interviewing government officials about their “capacity building” needs in the provision of health services, and they mentioned that you were the 4th consultant that year asking the same questions (likely they just misunderstood the nuance of the important information you were gathering), it was kind of justified to travel business class because (as you understood once you crossed over to the dark side and joined the UN as permanent staff) your flight contributed to “aid delivery” (i.e. spending donor cash). Clearly in this case, buying an economy fare USD 1,500 ticket would have actually been counterproductive as it would have required spending additional time and resources thinking about how to spend the left over USD 8500. That might have meant designing a new activity, identifying another consultant, drafting a terms of reference, etc, etc. Way too much work and takes way too long, particularly when there’s a deadline for spending the money and no one (eg donors) is really checking the impact anyway (the important thing is the burn rate). When forced to fly business class, on the return leg of your flight, by the way, you’ll want to avoid going to the airport with any of your local colleagues who were helping out on this same mission. Your flying business class will only raise uncomfortable questions. Your local colleagues probably don’t really understand all the complexities involved in this decision to fly you business class, and it might be seen as you having some sort of privilege (which is not really the case). (And anyway, you didn’t ask for it! You’d be totally fine flying economy. So why should you have to take the heat? It’s so tiresome to explain these things when they are really not your fault). What it comes down to is being against business class in principle, even if you can’t always translate that into practice. Like every good EAW, you really like not traveling business class, and you do certainly try your best to avoid it whenever possible. Former colleague of mine, mid-30s, first mission in haiti, informed us all that she first flew economy when she was 32. Because “well, my parents weren’t aid workers”. Brilliant. Classic. I was ‘forced’ to fly business class whilst working for a certain government donor, and had to hide my ‘X’Aid notebook in case any journalists were on board… It was torture, hated it. Not sure what was worse, the Bollinger, the canapes or being able to sleep flat on an almost round the world flight (and back). While I never was an aid worker, I was a proud foreign language teacher forced into the first class cabin by the vagaries of an overbooked $91 international flight. Can’t recall a time I’ve felt such guilt since. Good post! There are circumstances where flying economy class on a donor funded project is counterproductive. Take the situation that you have been asked to attend high level meeting and make a presentation that will be used to influence high level government and/or private sector officials in making an investment decision. The meeting is on the day after you arrive from a 20+ hour trip (10+ hour time difference). Your entire flight was spent stuck in a center seats in economy class trying to sleep with your knees pressed against the tray table in front of you, battling the persons on both sides of you for just a few hours of armrest time, alternating between two uncomfortable upright seated sleeping positions and waiting for the person in the aisle seat to blink so you can get out to use the bathroom. While the difference in airfares between economy and business is approxiately $2,000, your presentation will influence the investments of millions of dollars. Unfortunately, you have had two consecutive sleepless nights on a crowded flight, you look like hell and find it near impossible to stay awake in the meeting where all participants are looking for advise from the “foreign expert”. Not all EAW’s work for NGOs on community health projcets. Why not arrive a day early and rest? Is your time worth $2,000 per day? I would add to this… the only thing EAW’s love more than not flying business class… is talking / pleading / crying / begging on both knees / pointing to the mud on their boots and MSF sticker on their luggage or by any other means getting themselves a sweet _free upgrade_ to business class! Serious field cred to be had at the check-in counter! To be honest flying economy class for up to 20 hours would be fine for me, however 30-40 travels (so two nights rather than one) which is unavoidable when travelling to some destinations is quite unpleasant in economy. You tend to arrive a train wreck, and you cannot be very productive during that time. Also lack of lounge access in 8+ hours of stopovers is not too great (depending on the airport). 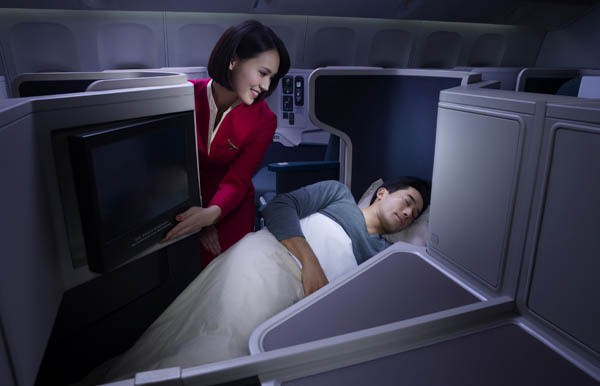 I would say increase the number of hours for travelling business class from 8 hours or so to something closer to 20, but save the business class for those really long trips. In addition, avoid travel if possible. Shorten the stays, combine trips, and use video conferencing.